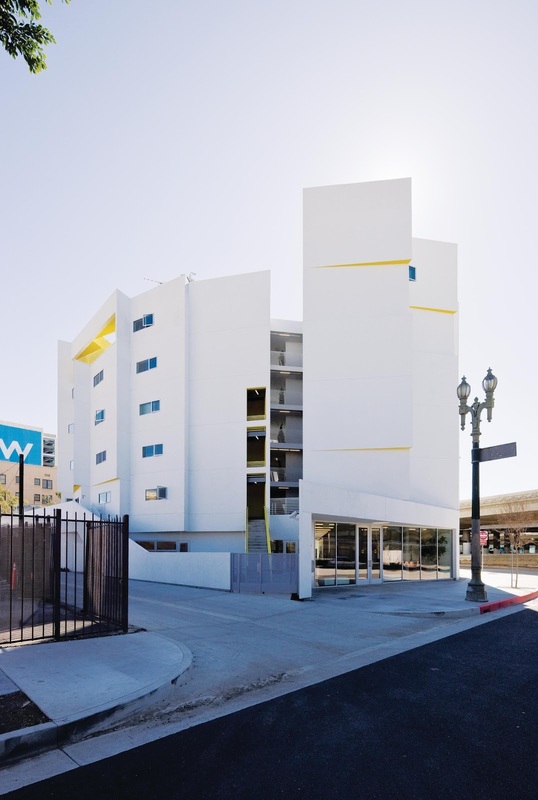 Located just south of Los Angeles’ fast-growing downtown and immediately adjacent to the I-10 freeway, Skid Row Housing Trust’s New Carver Apartments explores how architecture can create both new possibilities for its highly vulnerable, dramatically under-served residents as well as for the city at large. 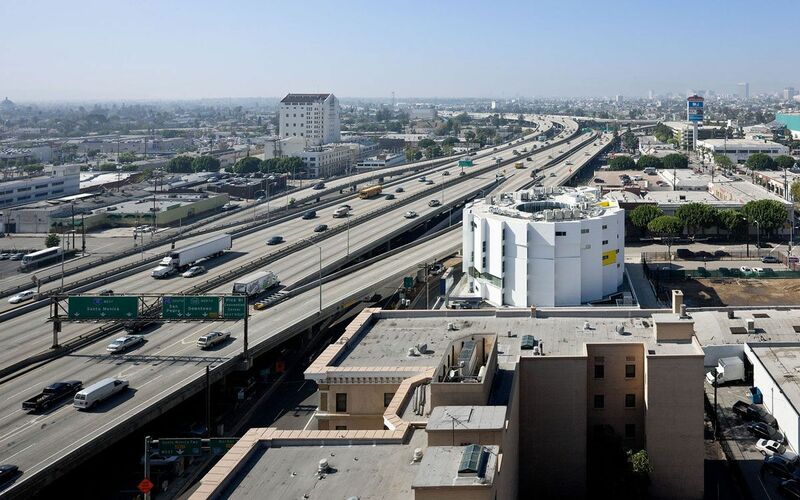 The project aims to construct not only a new optimism for public housing in Los Angeles, but to form an armature for change through architecture. 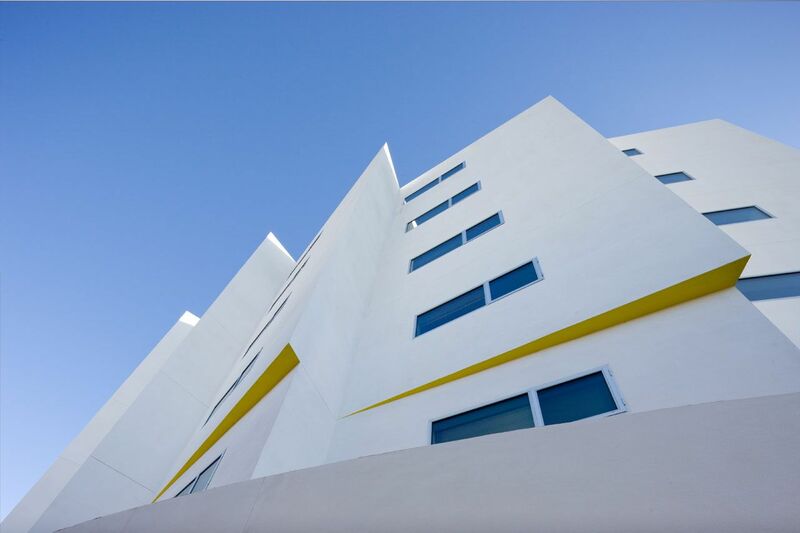 Nearly a mile from the heart of Skid Row, the project’s 97 units provide permanent housing for formerly homeless elderly and disabled residents, a place for solace, support, and individual growth in the face of the city’s chronic homeless problem. 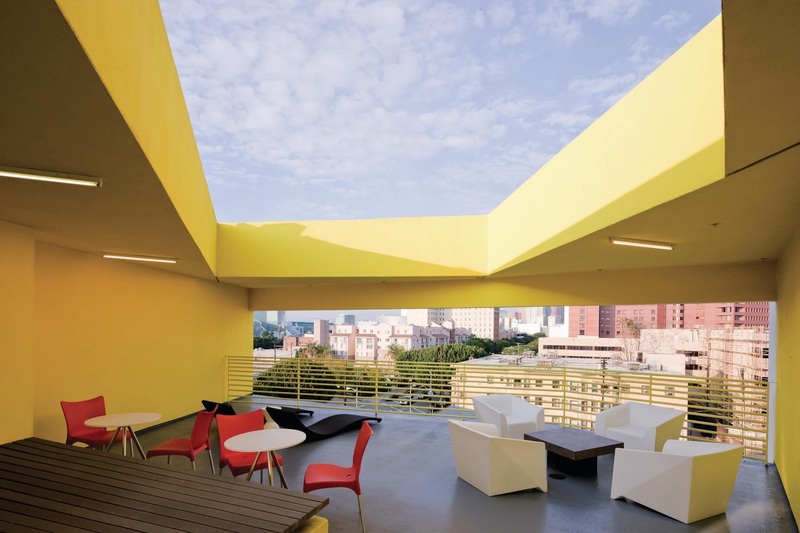 By incorporating communal spaces– kitchens, dining areas, gathering spaces and gardens –into the Carver’s raised form, as well as medical and social services support facilities into the plinth beneath, the project encourages its residents to reconnect with each other and the city beyond. 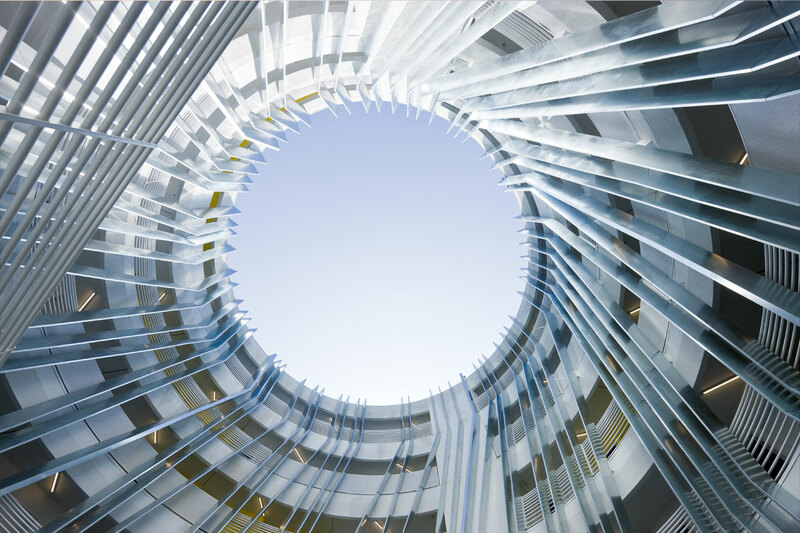 The Carver’s six-story circular form emerges from the path of the Santa Monica Freeway as it traces the site’s southern edge, its spiraling shape defining a private outdoor courtyard at the building’s center which provides each unit with natural lighting and views in all directions. 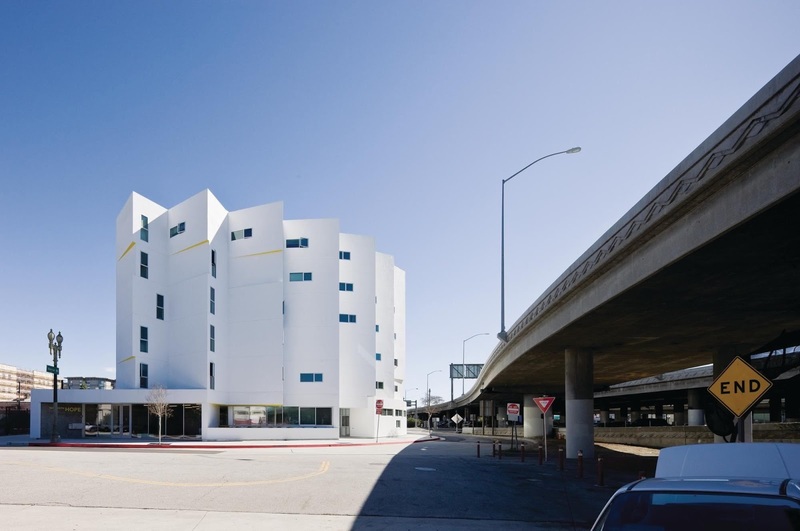 Confronted with a significant level of ambient noise from passing automobiles, the form creates a sound buffer by minimizing the building’s area directly opposite the freeway; smaller-scale facets position unit windows perpendicular to the direction of sound, further shielding the units themselves. 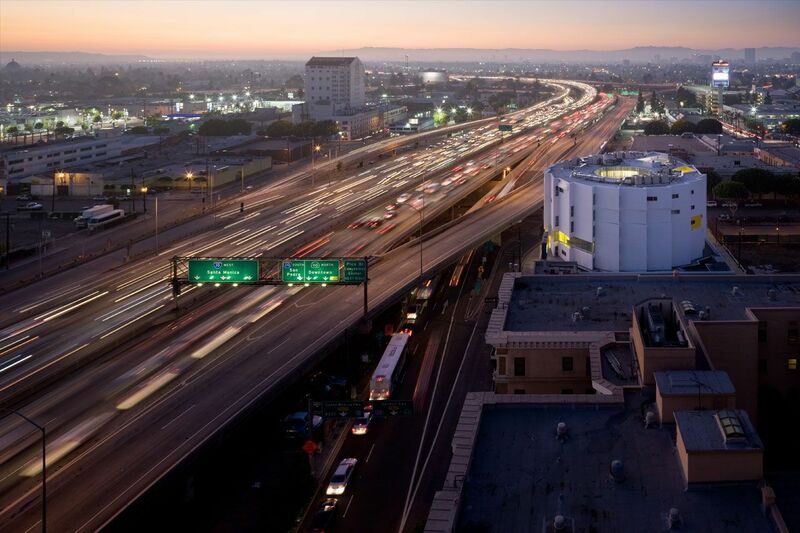 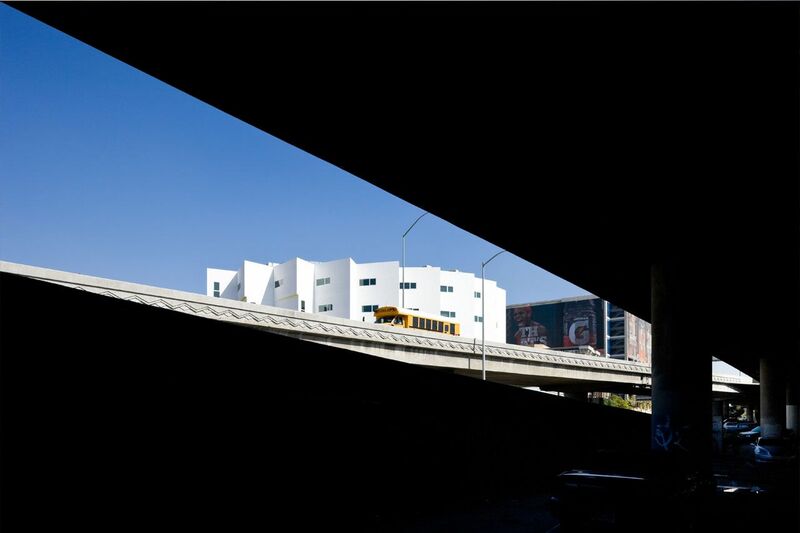 The façade underscores the relationship between the building and the freeway, creating a subtle pattern of light and shadow further animated by the illumination of passing cars. 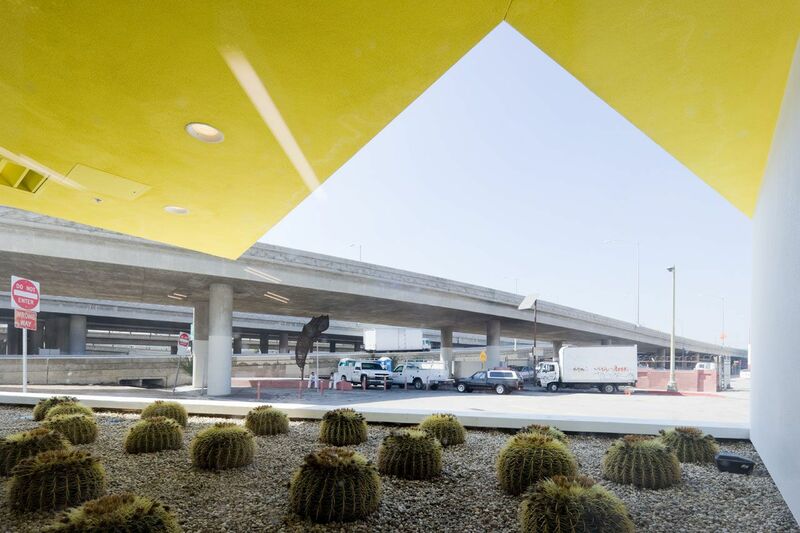 As automobiles pass from east to west, the building’s façade transforms itself as its sawtooth facets open to view. 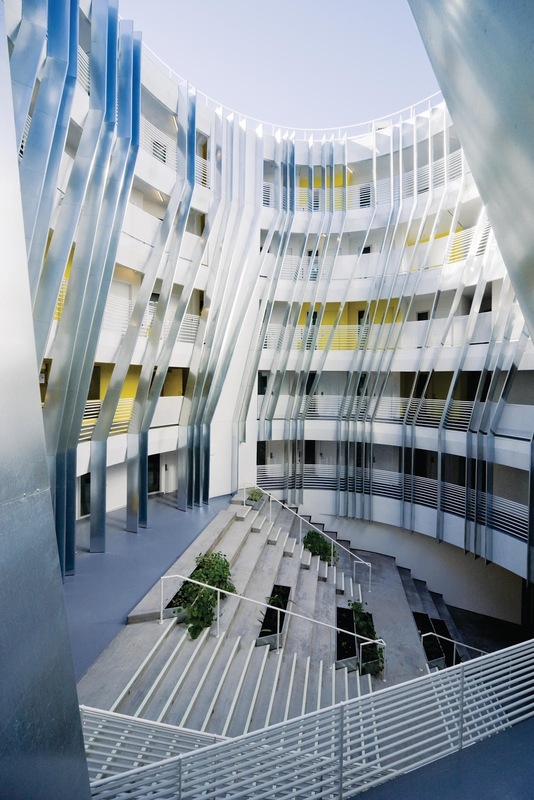 At the street level, a series of lines trace across the building’s plinth; these primary circulation paths create views deep into and across the block. 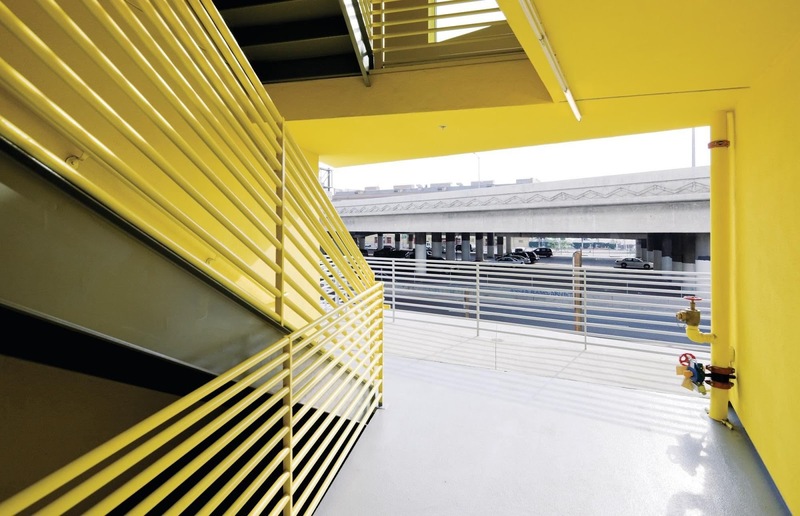 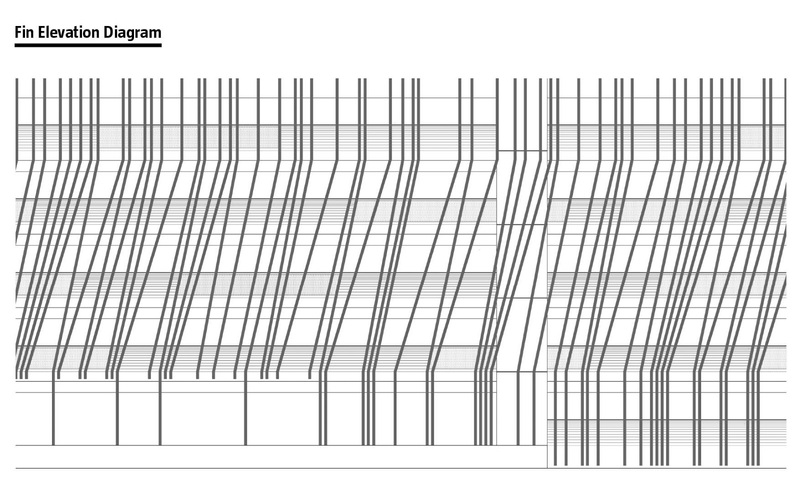 From the building’s entry at the northwest corner, the tapering spaces form an array of interior streets which traverse the building’s interior and connect to the streetscape beyond. 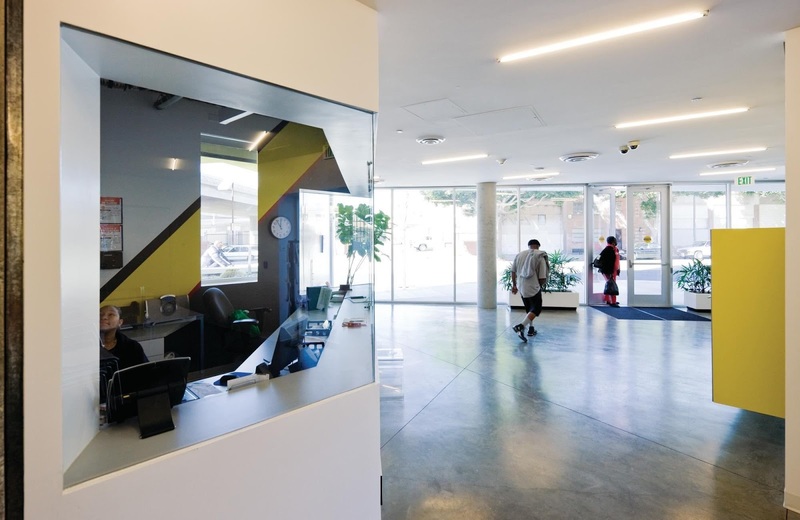 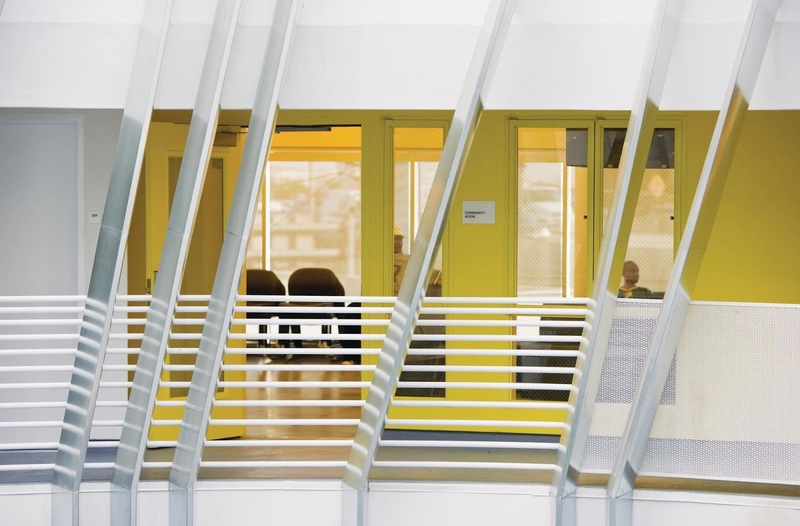 Immediately adjacent to kitchens, dining areas, and other common spaces are medical and social service spaces, forming a network of community connected to both individual units above and the city as a whole. 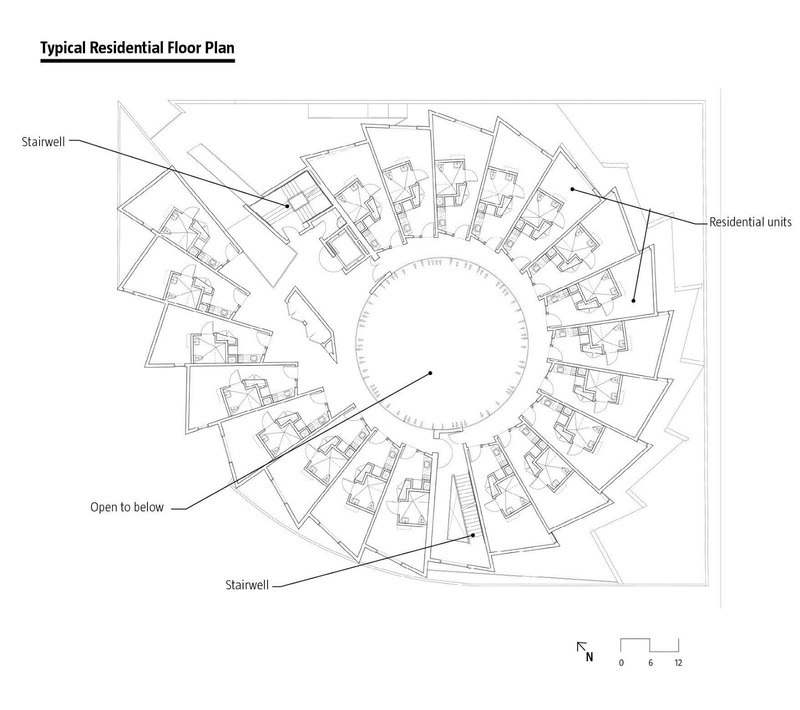 The ground plane of the street continues through the lobby to the building’s center, where it lifts into the central courtyard’s broad stair. 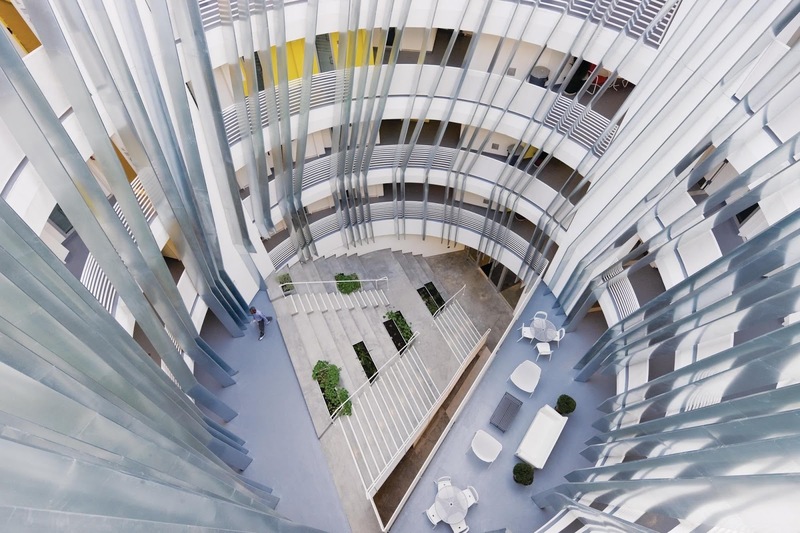 Individual studio apartments are arrayed off this central courtyard area on the five floors abve. 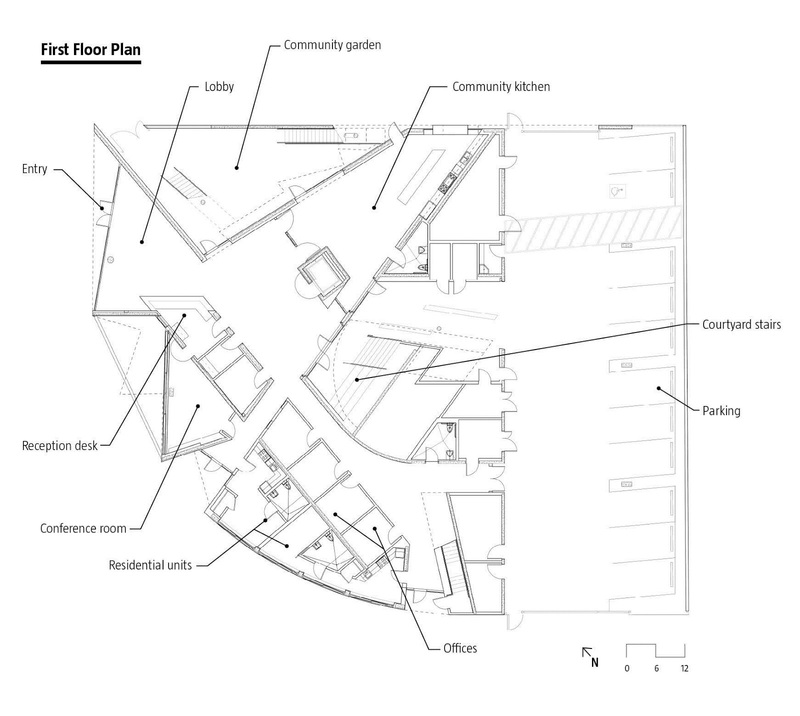 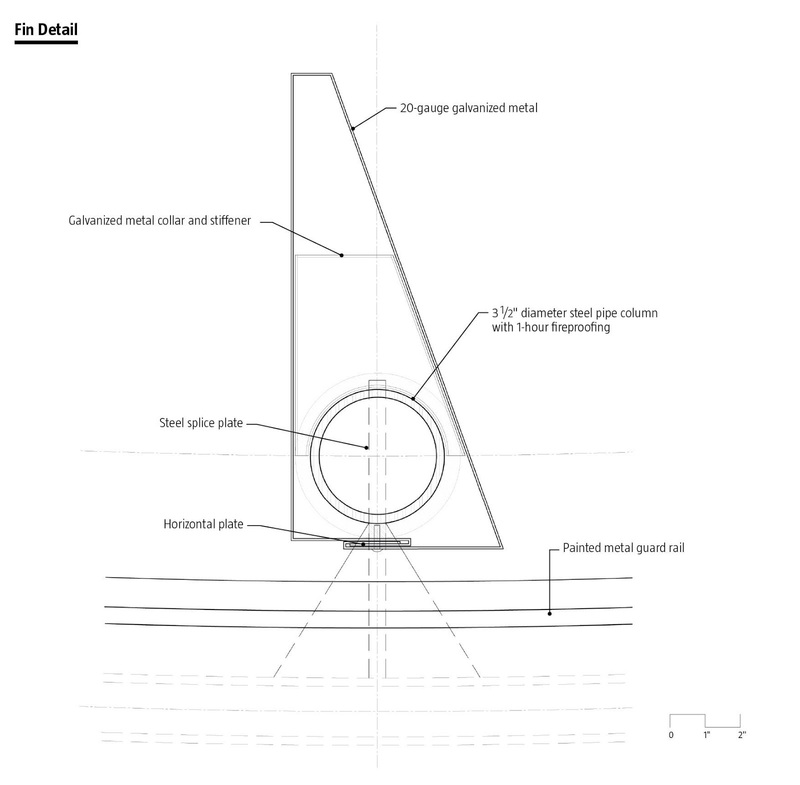 A series of fins trace across the circular edge of the central space as it rises through the building, creating a rhythm of light and shadow across the gathering spaces below.